This bed size is the most popular single size in the UK. An ideal size for growing children and those happy to snug up in their own cosy space. This size can also be part of a zip and link small king size bed that can be linked and separated. Its also a great for smaller bedrooms, caravans or chalets, where a single 3ft bed might be too big. We make superior fitted sheets for UK single beds. 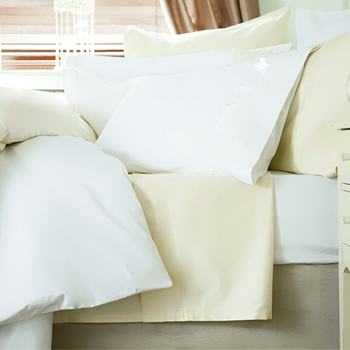 Our sheets are made with french corners and an all round elastic hem for durability and ease of use. We manufactured in high quality 200, 400 & 1000 Thread Count fabrics in a range of depths to cater for all types of single beds. If you can't find your size or require any samples please call us on 01706 220020 or contact us. 100% Cotton Duvet Cover & Pillow Cases for UK Single Duvet54 x 78" Single Duvet Cover. Ide..